There is nothing better when out in the woods than kicking back in a camping chair and enjoying the sights and sounds of nature. Whether you are on your patio, in the backwoods, or around a campfire with a marshmallow roasting on the end of a stick, you want to make sure there is a sturdy, comfortable chair beneath you. 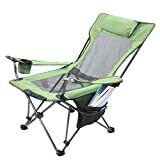 In my experience, based on the type of trip you are having, you will either want a camping chair that is luxurious and comfortable or one that is compact and easy to transport. Comfortable chairs should be reserved for trips without much walking – maybe for a camping trip with a nearby place to park your car. In contrast, overnight hiking tips require you to haul your equipment with you. If you want to bring a chair, it had better by small, light, and easy to carry. 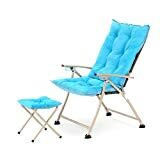 Below are the three best comfortable camp chairs, and the three best compact camp chairs. Decide what type of trip you want to take, and invest appropriately. These chairs are great for kicking back with a book or a beer (or both), or for lounging around a crackling fire. They do not require much setup, and they may even rival the comfort of your indoor furniture. At first glance, this chair looks like a standard camp chair, but it has some super important and luxurious features. First of all, the bottom and back panel is made of mesh, which means you will stay cool on the hottest of days. Also, it comes with a built-in neck pillow, cup holder, and magazine caddy. Most amazingly, if you lift up on the armrests and lean back, the seat actually reclines. The chair does fold up into 89 cm x 18 cm, making it convenient to store, but maybe not the smallest to carry. This chair is great for anyone looking to really relax outdoors. This chair truly has it all – comfort wise I mean. Not only does it recline and come with a built-in cup holder, but it has comfort features you couldn’t even dream of! Amazingly, the chair features a detachable footrest, an insulated pocket that can keep up to 4 drinks cool, and a detachable umbrella for sun protection. I think this chair is what whoever coined the term “happy camper” was referring to. It comes in three great colors and folds down into a carrying case that is slim, but not tiny. This chair promises to keep whoever is sitting it in comfortable, relaxed, and protected from the harsher elements. This camp chair most closely resembles indoor furniture. It comes with a removable seat and back padding, reclines, and comes with a separate footrest! The chair itself is made of a breathable mesh, and the padding is made of cotton corduroy. Both the chair and the footrest fold up for storage. This chair comes in three fantastic color options. 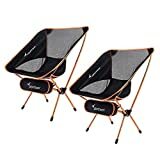 These chairs fold up into really compact pouches that can be thrown into a backpack or over your shoulder for easy transport. If you are looking to spend some significant time outside, you should definitely have one of these on you. This chair is constructed of a lightweight aluminum, and the shock cord pole structure makes it easy and intuitive to set up and break down. It all packs into a 14” x 5.5” carrying case, which when not in use, attaches right to the bottom of the chair, making it hard to lose. It only weighs 2.2lbs, a lightweight addition to your camping equipment. This chair is even an Amazon Choice item, so you can feel confident in your purchase. If you are hiking to your camping spot but still want a chair to relax in by the campfire, make room for this chair. You won’t regret it. This chair features lightweight aluminum and a shock-cord structure for easy setup. It weighs a tad more at 3.7 lbs but features a higher back and built-in sponge pillows at the neck and back for added comfort. The back panel is made of mesh, which will help to keep you cool. It comes with a carrying case that measures only 17” x 6”. This is a great thing to have with you if you need something lightweight, but supportive. I wouldn’t opt for this one if I were going to be on the trail for more than two days or so, but for quick trips that still require a haul to your campsite, this is a great option. This chair looks nothing like you would expect a camp chair to look like. It mostly resembles a beanbag – but instead of being filled with plastic “beans”, it’s filled with air. To set it up, you just pull the sleeve out of the 12” x 7” x 3” pouch and wave the sleeve through the air like a windsock. Once you have enough air in the sleeve, you pinch it closed and secure it. 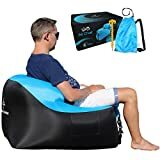 It is basically a self-inflating blow-up chair. It may seem unconventional at first, but trust me, this chair is super comfortable. The carrying case even comes with an over the shoulder strap, so you don’t have to sacrifice backpack space. This would be my chair of choice if I were to be on the trail for a long time. Camping is the ultimate choose your own adventure game. Do you want to relax? Rough it? Explore? Exercise? You can do all of that and more! No matter which adventure you choose, make sure you have the best equipment to support and carry your ventures. Choose the chair that is right for you, and enjoy your time outside!